Notes in Motion offers Community Programs and Out-of School Time on evenings and weekends. These programs include workshops in different dance styles and techniques, get moving programs, nutrition and lifestyle coaching — interactive learning that multi-generations experience together. Programs include: group discussion, physical dance classes, small group creative exploration, critical feedback, work sharing, work time, props, costumes, live and recorded music, and writing exercises. Community programs can be linked to community goals, challenges, and social issues or organize around the process of making dance theatre. Most community programs culminate in a performance presentation created by program participants. In addition to Notes in Motion Community Programs and Workshops, Amanda Selwyn Dance Theatre performs selections from its rich repertory at our partner schools. Some performances are followed by a workshop or discussion with audiences about the content/theme/style of the performance, careers in dance, as well as training, rehearsing, and understanding the process of creating dance. Credit Suisse Volunteer Event, Making a Difference with Dance: Integrated Arts Education Practice, Process, and Stewardship. October 5, 2018 — PS 63 S.T.A.R. Academy in Manhattan | Notes in Motion Teaching Artists, volunteers from Credit Suisse, and 3rd and 4th grade students from PS 63 worked together in small groups to create an original dance performance that involved shape-making, collective sculpture, locomotor movement, and a unison dance phrase. April 18, 2018 — Notes in Motion Teaching Artists participated in a 60-minute PARENT WORKSHOP with a focus on engaging families in our dance partnership. Parents got up on stage and danced and discussed the value of having dance as part of their child’s day. March 22, 2018 — Amanda Selwyn Dance Theatre performed an excerpt of Crossroads during the culminating dance residency event at our flagship partner school, PS 63 Star Academy, Manhattan. 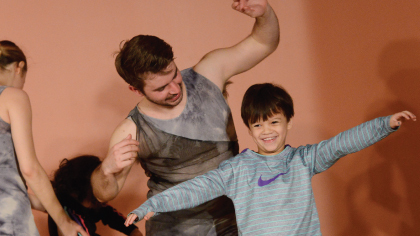 March 3, 2018 — This community program is intended to cross generations and to provide an opportunity for parents, grandparents, siblings, and students to experience the creativity of dance-making together. Amanda Selwyn Dance Theatre performed an preview of their new work Crossroads and then lead interactive workshops for audience members. January 8, 2018 — To kickoff our 2018 Dance Residency Program, Amanda Selwyn Dance Theatre performed an excerpt of Refuge. Following the performance, dancers led an interactive workshop with students, exploring different choreographic elements from the excerpt of Refuge. Notes in Motion teaching artist, Geneva Jenkins, instructed a Choreography Master Class at the Family Get Moving workshop. Workshops gave parents and their children danced together learning, African & Modern Dance, as well as Yoga and Meditation. October 6, 2017 — To launch our 2017-2018 dance residency at PS 63 Manhattan, students and Credit Sussie Volunteers worked together to create an original dance performance that involved shape-making, collective sculpture, locomotor movement, and a unison dance phrase. May 6, 2017 — PS 78 Bronx Families had an opportunity to participate in a Creative Dance Workshops based on Amanda Selwyn Dance Theatre’s evening length piece, Refuge. May 13, 2017— Amanda Selwyn Dance Theatre performed an excerpt of Refuge and had a brief Q&A talk back. After the performacne the dancers lead a creative workshop with audience members. April 1, 2017, —East Village Community School families had an opportunity to participate in a Creative Dance Workshops based on Amanda Selwyn Dance Theatre’s evening length piece, Refuge. March 25 2017, — Amanda Selwyn Dance Theatre participated in a community event at East Village Community School. The company performed an excerpt of Refuge and had brief Q & A with audience. After the performance, audience members had an opportunity to participate in a movement workshop entitled “Fundamentals of Dance | Space, Time & Energy”. The interactive workshop explored rhythm, pattern, motif, partnering, trust, and impulse.